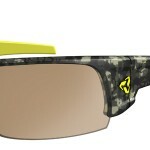 Revant Optics designs aftermarket lenses for eyewear brands such as Oakley, Rudy Project, Ray-Ban, Spy Optic, and Costa. The company was founded in 2010 under the name Visionary Lenses. Since then, they have re-branded and currently make advanced custom replacement lenses under the name Revant Optics. The Elite HC3 is Revant’s most advanced lens as well as the most recent addition to their lineup. I received a set of Elite HC3 replacement lenses for my Oakley Flak Jacket frames and have put them through several weeks of testing on group rides, in cross racing, and for everyday use. The lenses in many sunglasses are shaped from flat blanks. The subsequent bending and cutting of the material creates stress points and visual distortion in the lenses. The HC3 lenses are engineered using injection molding, this process serves to eliminate distortion and provide high impact resistance. Injection molding also helps keep the overall weight of the lenses down. Sunglasses, first and foremost, are meant to protect your eyes from the sun. Cyclists spend massive amounts of time in the sun. Even cloudy days only reduce UV exposure by about 20%. It is important to make sure your eyes are adequately protected from UV radiation so you can continue to enjoy the sport for a long time. The HC3 lenses block 100% of UVA, UVB, and blue light up to 400nm. If you are looking for a new set of lenses for your sunglasses, Revant Optics is a smart choice. When cycling, in addition to UV protection, your sunglasses need to protect your eyes from flying debris kicked up by cars or other cyclists. The HC3 lenses are ANSI Z87.1 certified, an upgrade over their other lenses. According to Revant they don’t just meet, they exceed the same ANSI standards used for safety goggles and other protective eyewear. It is nice to know that the lenses can withstand a solid impact without shattering. Refraction occurs when light passes through a medium such as water, turbulent air, or the lenses of your sunglasses. The velocity of the light waves is altered as they pass through the medium causing them to change direction, creating an altered or distorted image. 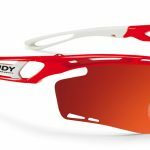 Whether you are riding along quiet country roads or racing at 25 mph, you want a clear image of everything around you, and refraction is definitely not your friend. 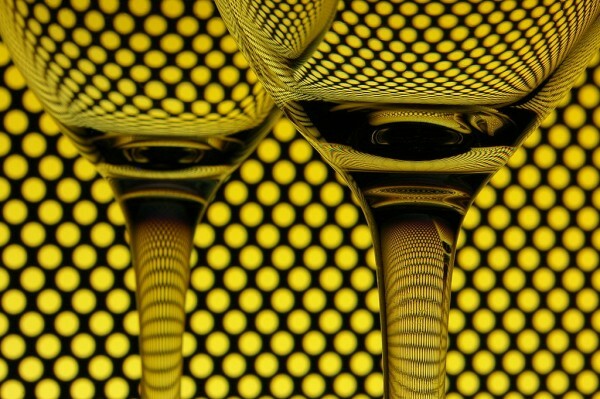 The background, seen through the wine glasses, is distorted due to refraction. A concern with any aftermarket product is how well it will fit with the stock product. This wasn’t an issue with the lenses as they fit perfectly into my frames and snapped solidly into place. When I first received the lenses, I replaced only one lens, keeping one of the original Oakley polarized lenses in for reference. The Elite HC3 was just as clear as the original with no discernible differences in visual quality. With both HC3 lenses in the frames they performed marvelously. Images were crystal clear with no distortion. 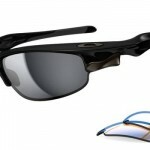 The polarized HC3 lenses also do a great job of cutting out glare. 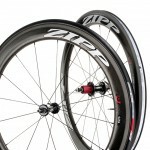 The lenses produce rich colors and nice contrast which is great for cycling. Eye comfort is extremely important after long hours in the saddle. 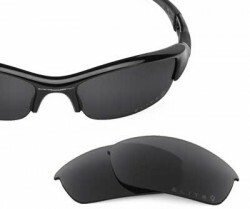 Even after hours of riding in the sun my eyes feel no strain when wearing the HC3s. The HC3 lenses I tested retail for $52 which is just over half of the price of the equivalent replacement lenses from Oakley ($90). That makes for a great value and a price that is a little easier to swallow when you need to replace your lenses. Currently the Elite HC3 lenses are available in Stealth Black but Revant plans on releasing more color options soon. Revant Optics stands behind their lenses. 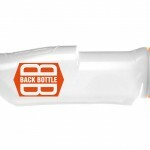 Their 100% satisfaction guarantee includes a 1 year warranty,a 60 day return policy, and free US shipping and returns. One of the drawbacks of expensive frames is they generally have expensive lenses. Revant Optics is making lenses that rival those of the top brands at a fraction of the cost. 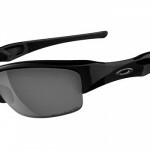 The Revant Optics Elite HC3 come in at just over half the price of the equivalent stock Oakley lenses. At the same time, the quality and performance are equal to the original lenses. If you are looking for a new set of lenses for your sunglasses, Revant Optics is a smart choice.